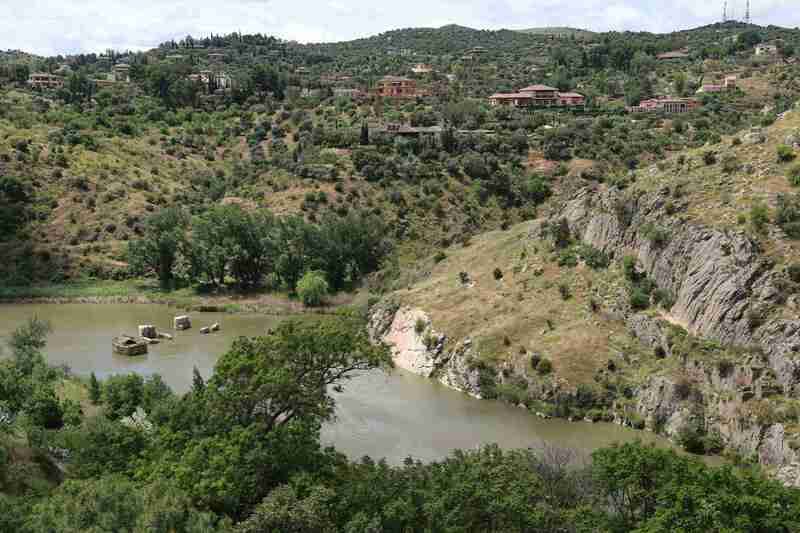 The Tagus River is essential to the making of Toledo, Spain. The river eroded the granite and created a promontory on three sides. El Alcazar, upper right began as a Roman mansion in the 3rd Century A.D.
Toledo, Spain is one of the jewels of Spanish history. 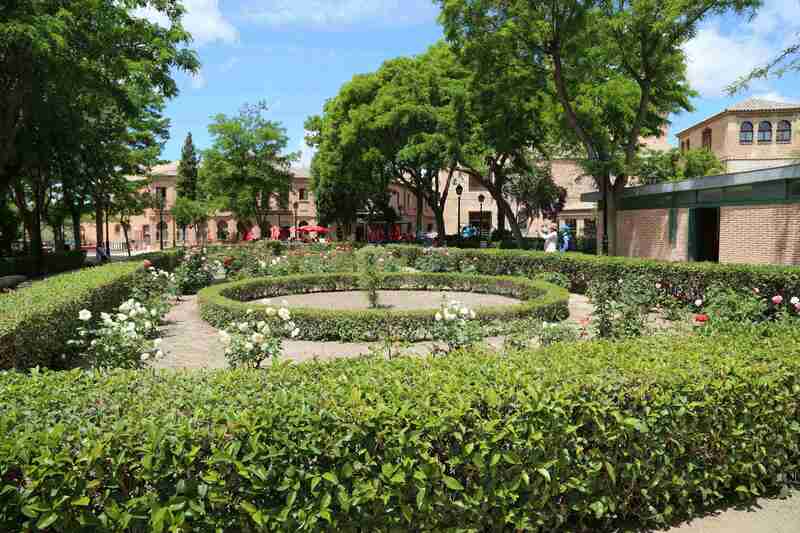 Toledo was a favored location because natural defenses like height and the steep hills kept the residents safe from attack. 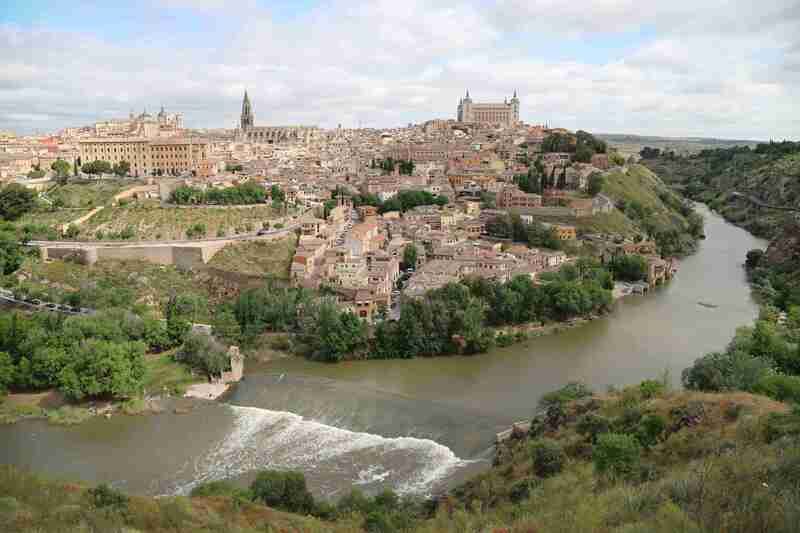 The view from the old city of Toledo affords a sweeping view of the countryside beyond the Tagus River. 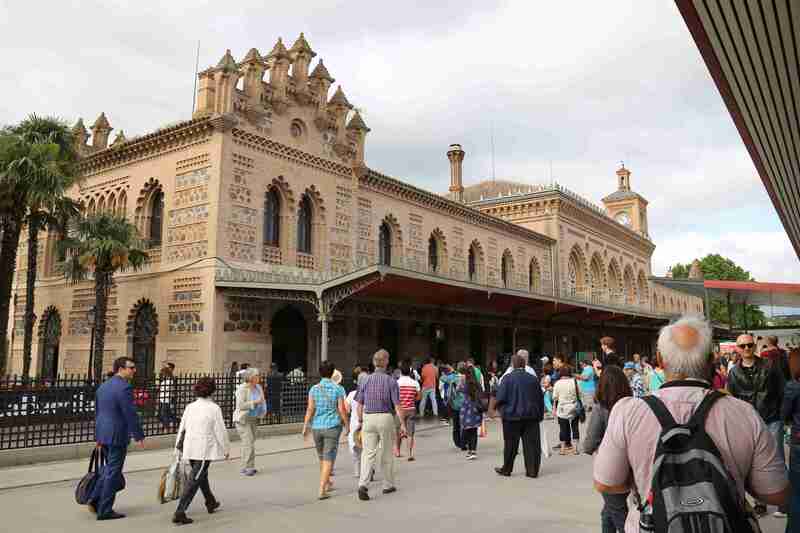 Today, visitors arrive in Toledo at the train station. 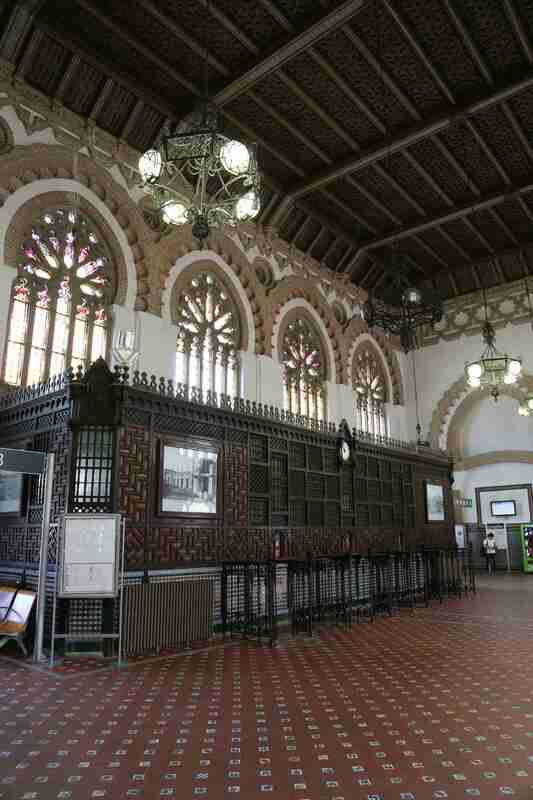 Inside the train station at Toledo, Spain, with architecture that reflects both Spanish and Moorish influences. 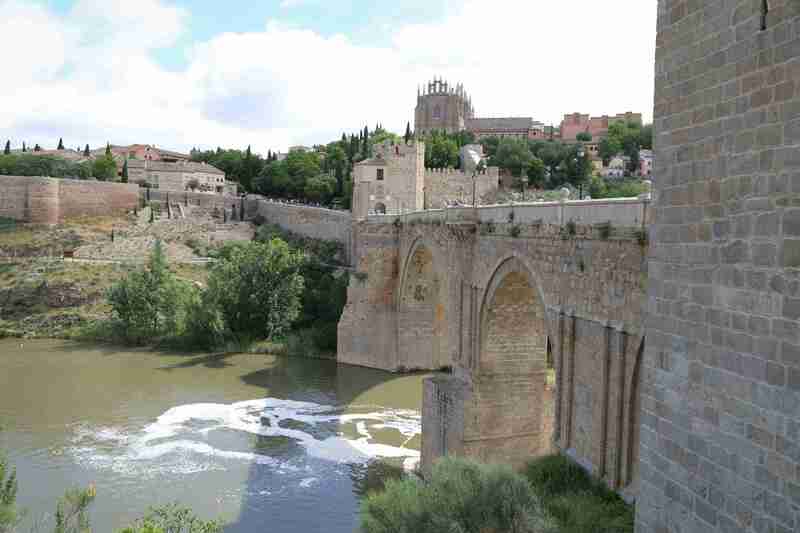 With plenty of granite to construct gates, bridges and buildings, Toledo became a city in an ideal strategic location. 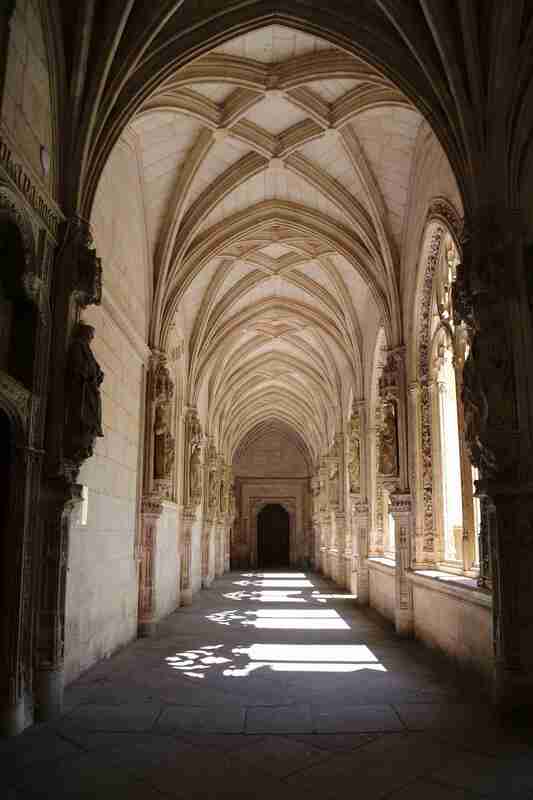 A corridor inside the clooister provides a quiet meditative space. 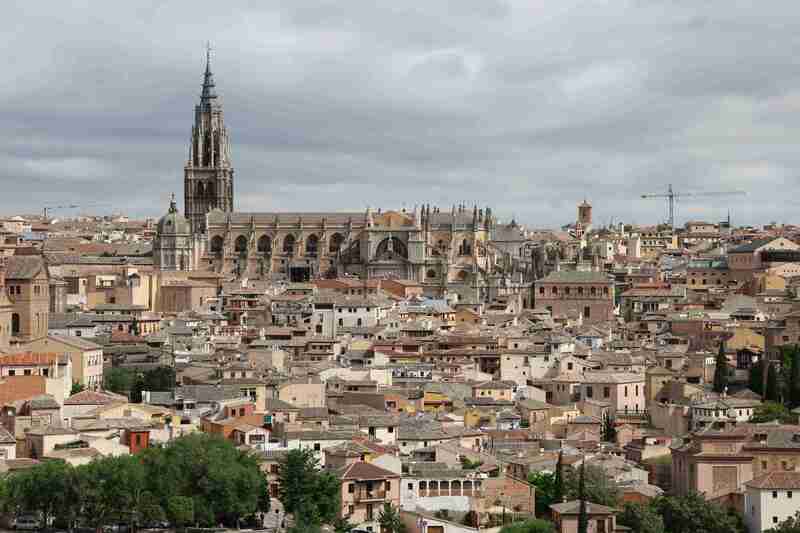 Toledo was for a time the seat of Spanish power before the king moved the capitol to Madrid in 1561. 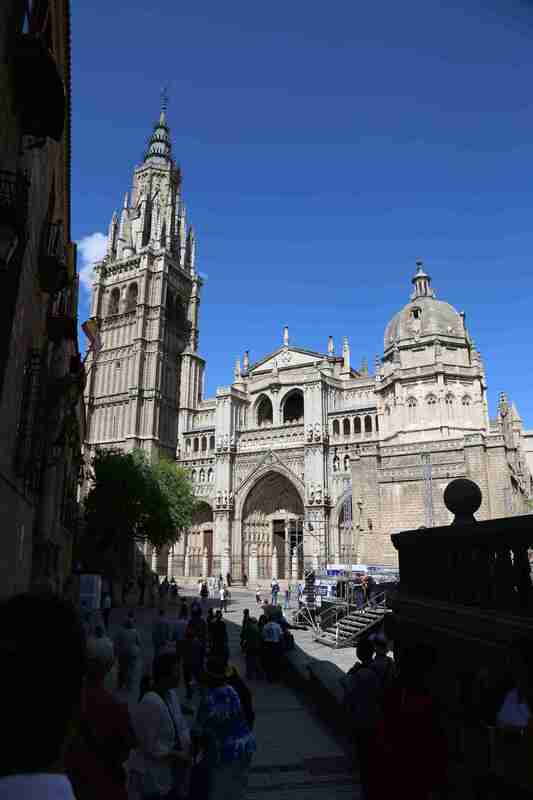 Catholicism was a central part of life during the height of imperial Spain and for a time Toledo was the national capital. Toledo’s fame was anchored in its renown as the best place in Europe for swords. 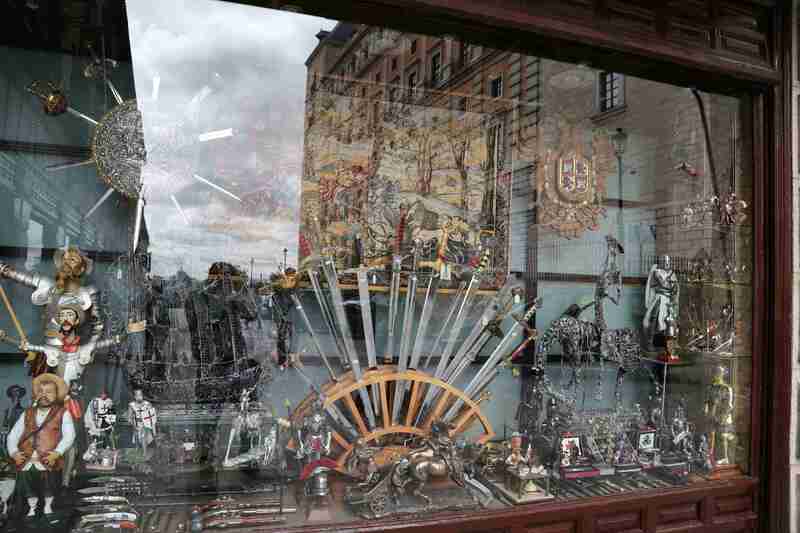 Today sword making is more of a craft than an industry, where shops like this one display the craftsman’s skills. This courtyard provides a place of tranquility. 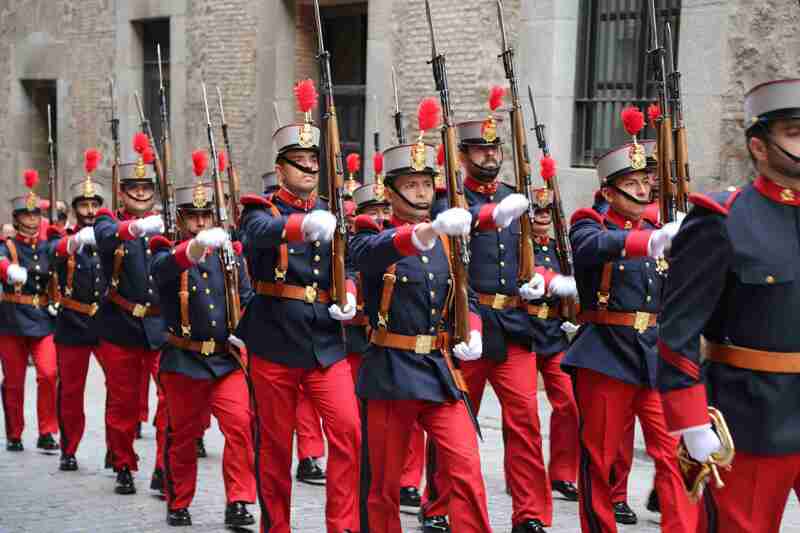 A group of soldiers in ceremonial uniforms march from El Alcazar through the streets of Toledo, Spain. 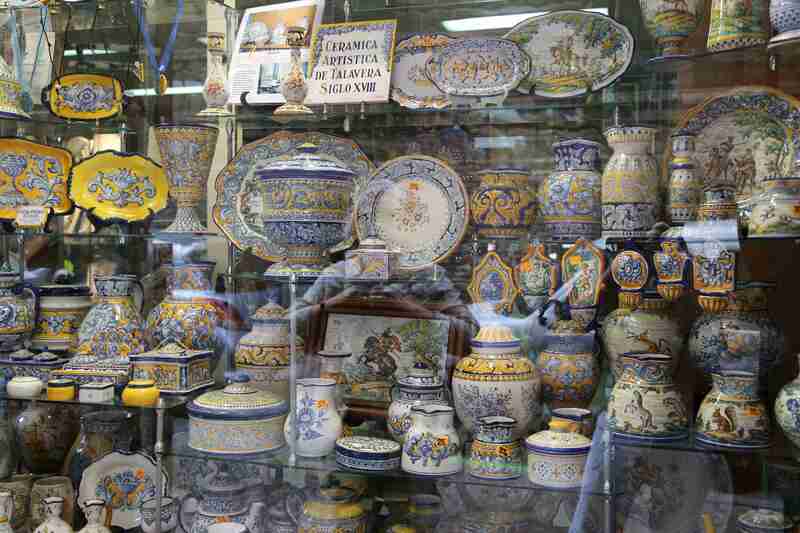 Colorful ceramics are displayed to catch the eyes of the tourists who flock to Toledo. 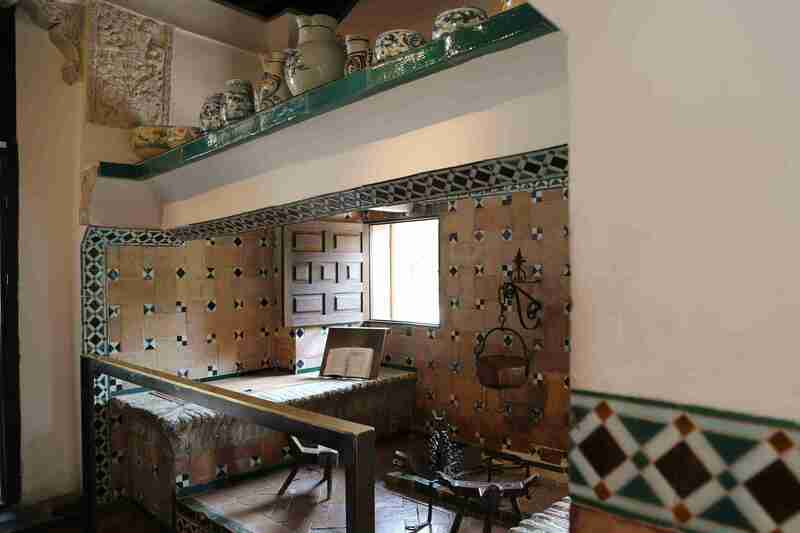 This room was used to prepare meals and would have been similar to that in El Greco’s house which stood nearby. 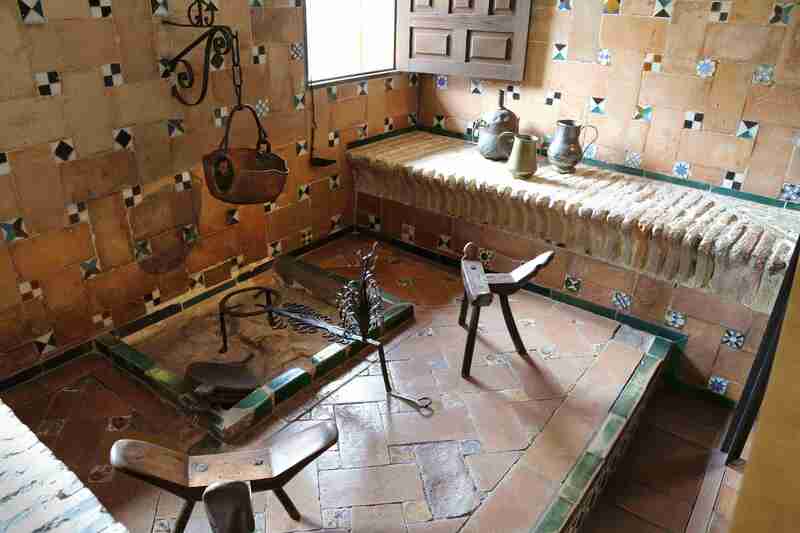 The bright tile and pattern evoke a sense of Moorish influence. 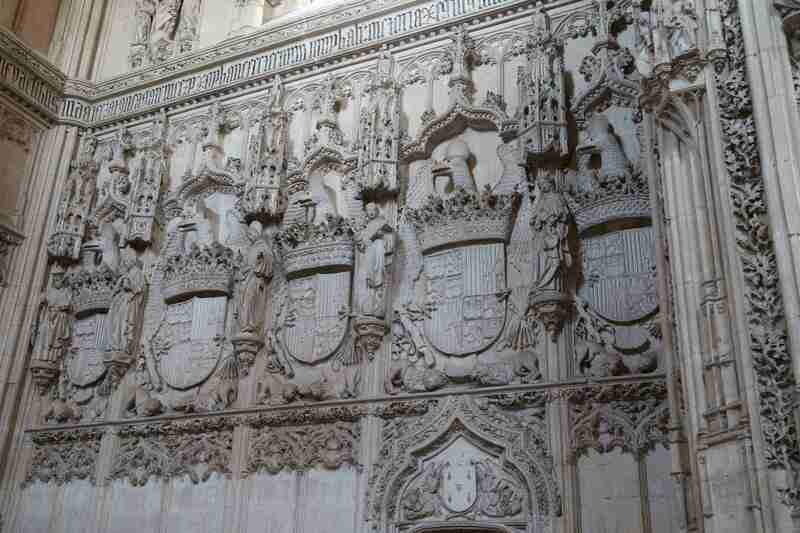 The cornerstone for the cathedral in Toledo, Spain was laid in 1226, but the complex was not completed until 1493. 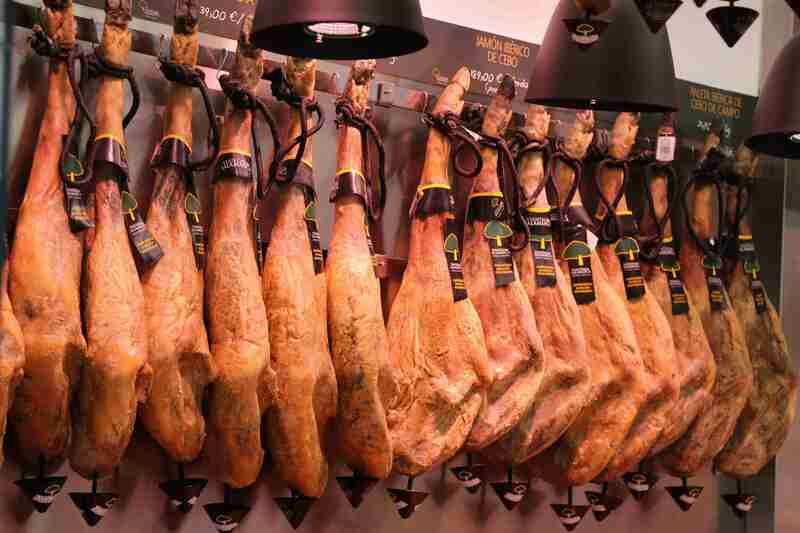 Spanish ham is some of the finest in the world and a number of shops in Toledo keep plenty in stock. The small cups at the bottom are there to catch the occasional drip of fat that might seep out. 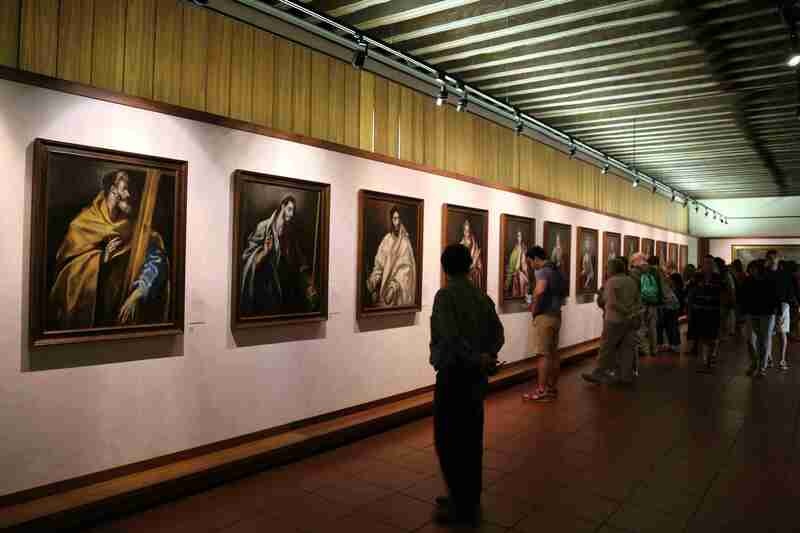 Toledo, Spain has an outstanding collection of paintings by El Greco where visitors can appreciate his unique artistic style. 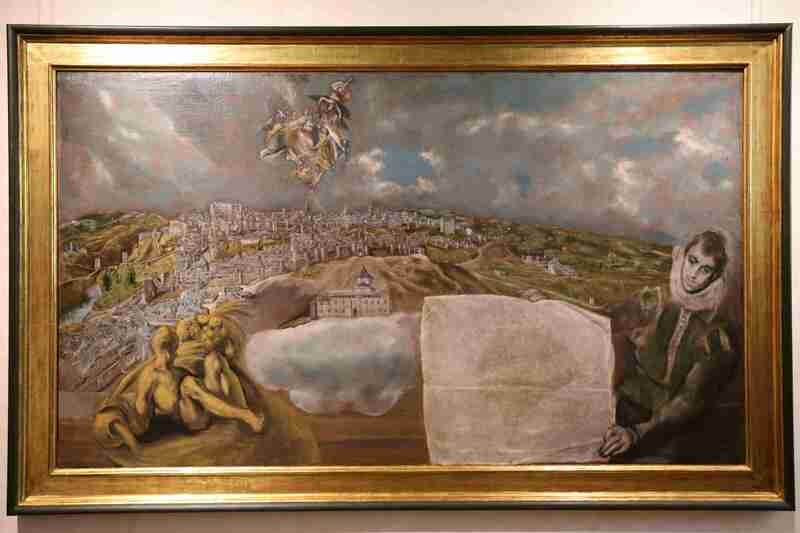 El Greco’s “View and Plan of Toledo” is one of only two surviving landscapes by the master, completed in 1608. 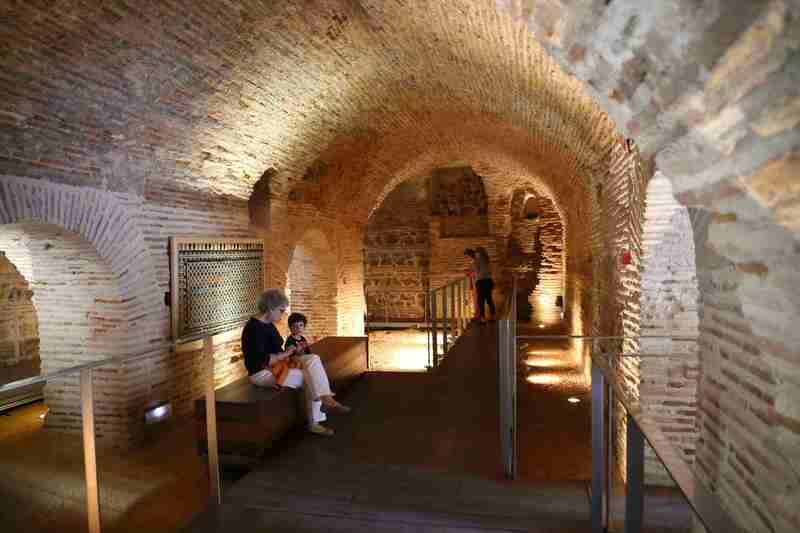 A woman and her grandchild find a cool spot to rest during their travels while other visitors take in more of Toledo’s history. 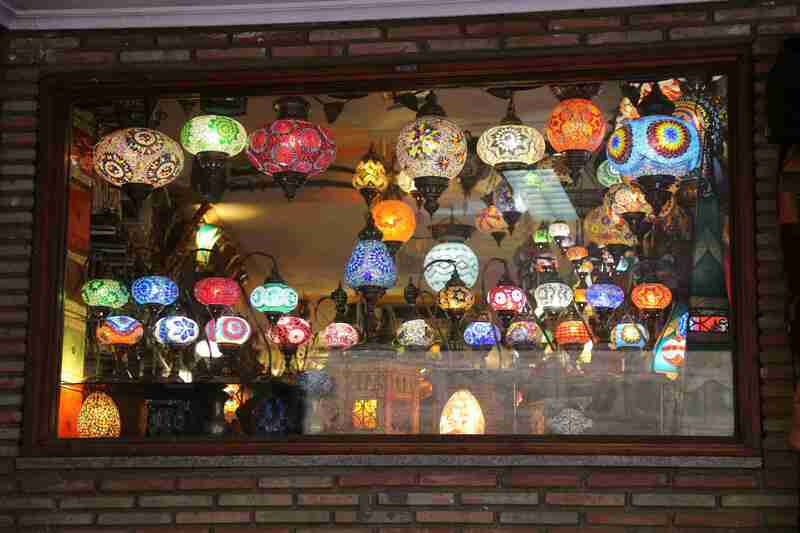 This shop in the old city of Toledo offers brightly-colored lamps for sale. 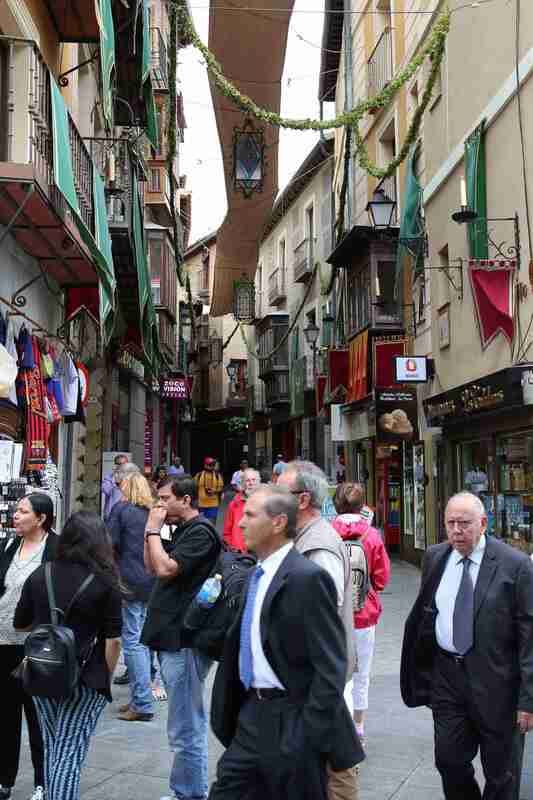 Tourists fill the streets of Toledo, where Christians heading off to the Crusades once roamed. 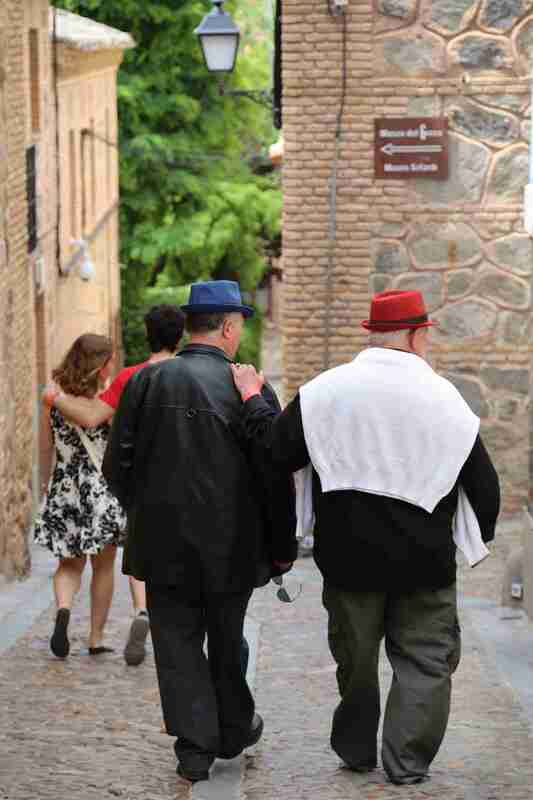 Young lovers and old friends show caring and tenderness during a stroll along the street in the old city of Toledo. 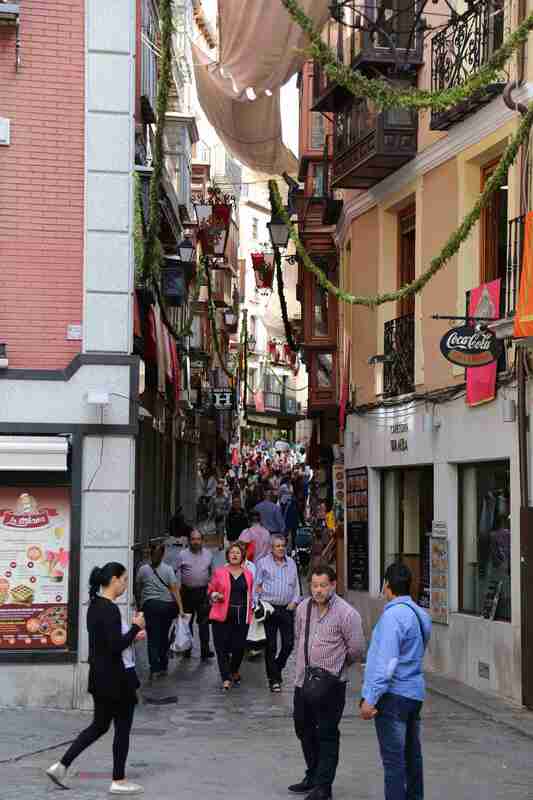 Toledo is a vibrant city where tourists and stylish business people mingle as they all head to their respective destinations. 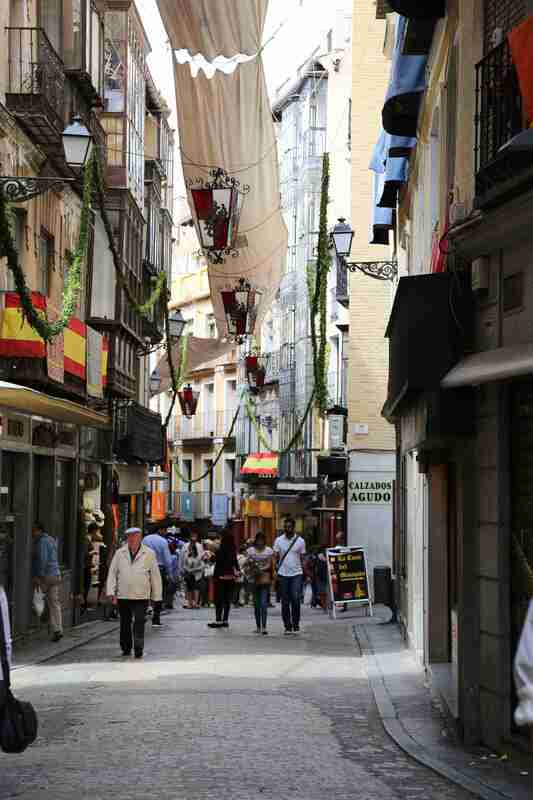 Awnings between the buildings along some of the streets in the old city of Toledo shade the people below from the sweltering summer sun of Spain. 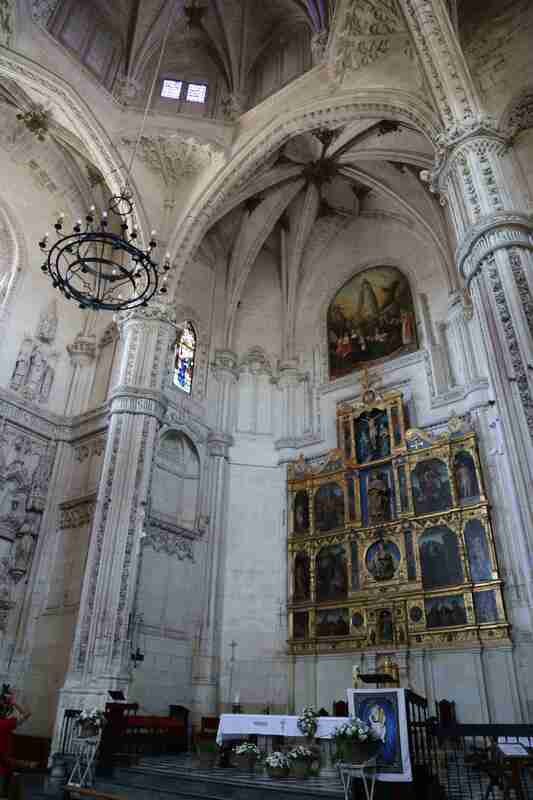 Santa Maria La Blanca has served as a house of worship for Jews and is today owned and operated by Catholics. 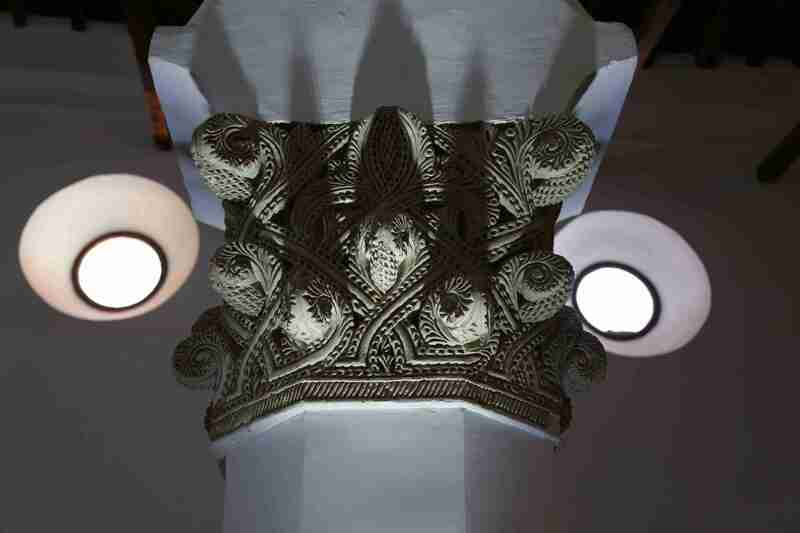 It was designed by Moorish architects with the idea it would be built for non-Muslim worship. 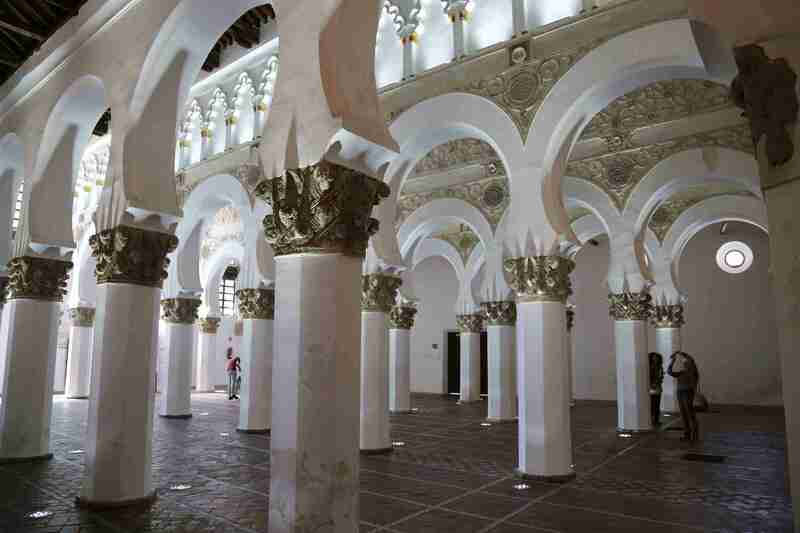 Construction was completed in 1180 A.D.
An element of one of the pillars at Santa Maria la Blanca.